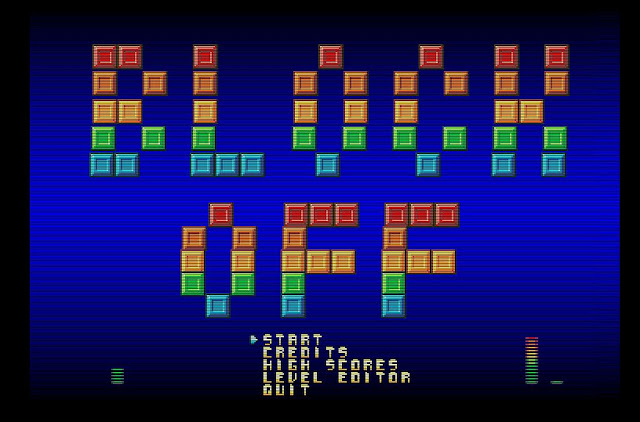 Indie Retro News: Block Off - A new WIP Amiga game for puzzle fans! Block Off - A new WIP Amiga game for puzzle fans! We've recently received a heads up in our email and via Facebook that a brand new game has appeared for the Amiga called ' Block Off ', which was made in AMOS by Colin Vella with a cool soundtrack by Simone Bernacchia. If you love puzzle based games and are sick and tired of platformers then read on, as this one will suit you perfectly! Currently available for free with the possibility of further updates, the idea behind the game is pretty simple. Move the blocks around the game area, match them together and watch them disappear. Beware though there is still a challenge to be had, as sometimes you'll have to move more than a few blocks to get them out the way and sometimes more than two blocks have to be joined together. Once all this is done it's on to the next level. What a lovely game indeed, playable on an A1200 config only! Links : 1) Source - Thanks Per-Ola Eriksson and Zbigniew Zieliński for the heads up!